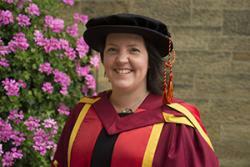 An American study abroad student who fell in love with north Wales received her PhD at Bangor University this week. Maggie Parke, 31, from Tregarth, originally from Lancaster, Pennsylvania in the USA received her doctorate degree in Film Studies after studying at the School of Creative Studies and Media. As part of her undergraduate degree at the University of Mary Washington, Maggie studied abroad at Bangor University in the fall of 2003. She had a fantastic semester of travel, study, and loved living internationally, so she returned to study for an MA in Arthurian Literature, and stayed on to study for a PhD in Film Studies. Maggie, who works as an International Officer for the University, said: “When I was eight years old, I read a series of books that took place in north Wales, The Dark is Rising by Susan Cooper, and I fell in love with the legends and landscape. I knew I’d study abroad here, and when I eventually did, it was such a positive experience: brilliant people, education, and location, so I came back." “I began working part-time at the University’s International Office during my PhD, and that has now turned into my full time job. I began as an International Student Ambassador, and now I’m a Country Manager. I now have the privilege to recruit American, Canadian and South American students to study Bangor, and build international relationships with institutions for research and mobility. I’m also working for a Wales-based production company, Elfin Productions, doing script development and project consulting; so I’m able to continue both interests: teaching and working in film whilst traveling abroad, and expanding the profile of the University internationally. “My PhD focus was on the adaptation of event films and fan management; my research took place on the film sets of Twilight and Captain America and I attended the Breaking Dawn book release in New York City. I’m active in film development and production, as well as utilising fan interactions. I will soon be a feature column writer for PagetoPremiere.com, and co-edited a collection of critical essays on Twilight published by McMillan in 2011. The highlight of my studies was hearing very successful filmmakers say ‘wow; that research could be pretty revolutionary’. I've also loved my time on film sets, and working with fans. Bringing research and data to a topic that is generally seen as just "popular fluff" is very satisfying, and teaching everyone from high school students to seasoned directors has been brilliant. I'm glad I have a topic that most people have an opinion about-- everyone's had a favourite book adapted; for better or for worse! “A low point was when my supervisor went to another university after my first year; that was a very tough transition. The School was great at helping me out though, and my first supervisor, Sam Rayner, was still very supportive, even though she didn’t have to be. “I love where I am right now; working for the University, helping other students to change their lives by studying internationally as I did. I’m lecturing abroad on film, adaptation and fans, and I’m also maintaining a life in film with sessions at film festivals, script editing, and consulting on film projects. It’s incredibly rewarding, varied, and allows me to keep all of my interests going; plus I still get to live between Snowdonia and the sea!